Dr. Ahmed Usman holds a PhD in Sociology from the University of Leeds, UK. 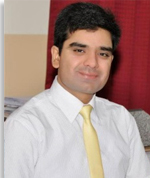 He started his career as lecturer at the Department of Sociology, University of the Punjab Lahore in 2004. His research interests are caste, religion and conflict, and involuntary resettlement. His teaching focuses upon qualitative research methods, resettlement and rehabilitation, and sociology of globalization. He has published in diverse areas in different peer-reviewed journals. He has the experience of working with the World Bank, ILO and various other national and international agencies on different projects.